Earn $0.70 in Rewards credit. Click to learn more. 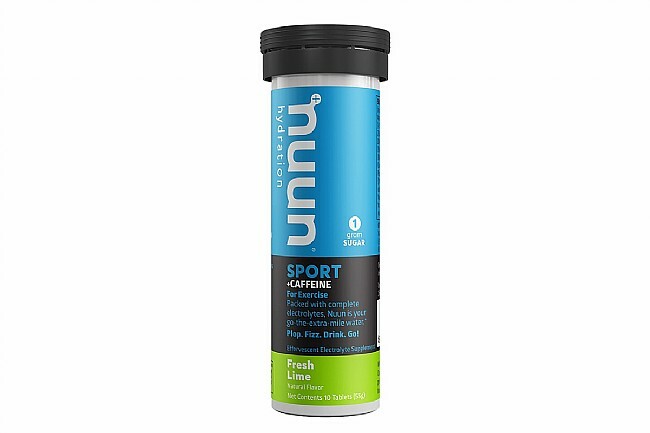 A tasty & hydrating blend of electrolytes, minerals and caffeine provides complete hydration with an extra boost. 10 tablets per tube. Dissolve in 16oz. of water. Serv. Size 1 tablet (5.5 g) (makes 16 fl-oz prepared), Servings 10, Amount Per Serving: Calories 15, Total Carbohydrate 2 g (<1% DV*), Total Sugars 1 g (Incl. 1 g Added Sugars, 3% DV), Calcium Carbonate (as Calcium Carbonate) 13 mg (1% DV), Magnesium (as Magnesium Oxide) 25 mg (6% DV), Chloride (as Potassium Chloride) 40 mg (2% DV), Sodium (as Sodium Bicarbonate, Sodium Carbonate) 300 mg (13% DV), Potassium (as Potassium Bicarbonate, Potassium Chloride) 150 mg (3% DV), Organic Green Tea Extract (containing 40 mg of caffeine) 53 (+) *The % Daily Value tells you how much a nutrient in a serving of food contributes to a daily diet. 2,000 calories a day is used for general nutrition advice. + Daily Value Not Established.